Ubisoft announces its $35 million investment in a Winnipeg studio on April 6. Winnipeg is welcoming Ubisoft to town. This is a pivotal moment for our city. Ubisoft is a company that is a global leader in their field. They could have chosen any number of cities to expand into, but they saw something special in Winnipeg. Our low cost of doing business, access to a strong talent pool and educational system, and a supportive and welcoming business community helped the company choose Winnipeg for their newest studio. Ubisoft is an international superstar – one of the largest, if not the largest, video game developer on the planet. They’ve created world-class, critically-acclaimed franchises like Assassin's Creed, Far Cry, Just Dance and the Tom Clancy series in the multibillion dollar gaming industry. And now, Winnipeg will be part of that story. The work that goes into attracting a company the caliber of Ubisoft takes time and hard work, as well as a business attraction plan that clearly demonstrates how a company can grow in that proposed center. For a long time, Winnipeg was not able to compete on attracting world-class businesses to invest here. That is all starting to change, and we are starting to punch above our weight class. YES! Winnipeg, the business development team in Economic Development Winnipeg, played a critical role in attracting Ubisoft here. Starting with a cold-call to Ubisoft, the organization prepared a collaborative outreach approach with the assistance of the Province of Manitoba and City of Winnipeg. 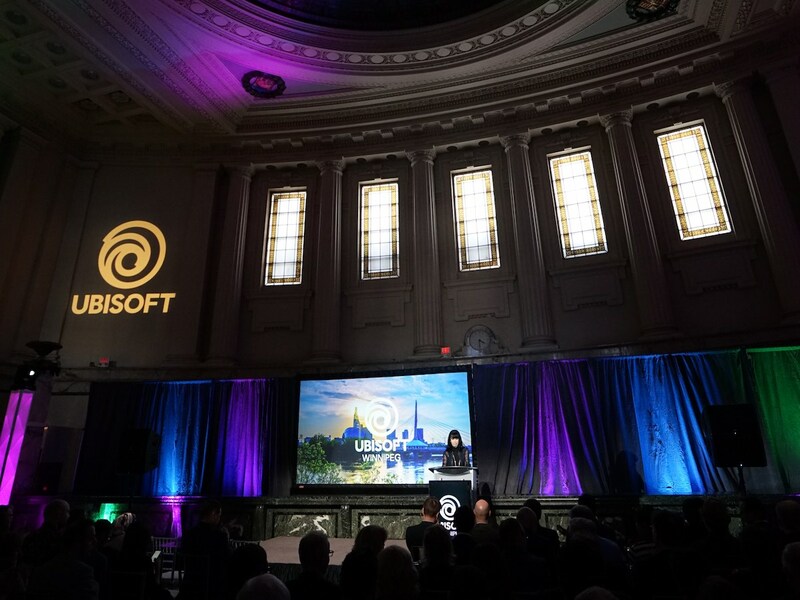 A large part of this effort included informing Ubisoft what Winnipeg could offer, from a high-class talent pool to a low cost of doing business, as well as a welcoming business culture that would allow them to set up here with relative ease. Attracting foreign investors requires us to have a united front – making sure that what potential investors see is a coordinated, cohesive approach in supporting them as they establish themselves. Manitoba has a sterling reputation in this regard. Our business community is one of our greatest assets. Ubisoft wanted a community that would support and welcome them, allowing the development studio to invest back into our local community. Winnipeggers should be proud that we can attract international companies like Ubisoft, as it sends a message to the rest of the world that Winnipeg is open for business. We want other leading international companies to hear that, and we will continue to push that message out. This opportunity allows Winnipeg to grow our already substantial interactive digital media industry, by continuing to attract talent and skilled jobs, and by creating an industry cluster which will drive significant economic growth. I’ve been told by Ubisoft how welcomed they’ve felt by our city, and how unusual it is for a business community to embrace them the way ours has. That’s something unique to Winnipeg, and an advantage for our city that we should not take for granted. Our friendly people and close-knit community truly are our greatest asset. Ubisoft will provide an opportunity for good-paying and highly-skilled jobs, which will help us retain some of our brightest minds. A vibrant community needs cutting-edge career opportunities and exciting companies in our own backyard that will become part of the city’s economic engine. It is also a compliment to the province’s existing interactive digital media industry. The work that existing local companies like Complex Games and Project Whitecard in this space are doing is already world-class, and Ubisoft’s recognition of Winnipeg as a place they want to call home, and will be able to find talent is undeniable evidence of that skillset. The private sector has a large role to play in what Economic Development Winnipeg does. Business attraction takes a concerted, long-term effort. If we want to see more companies like Ubisoft establishing themselves in Winnipeg, we need to step up, share our stories and invest in programs that can help attract new companies here, as well as help grow locally-based ones. Economic Development Winnipeg will continue to go after companies around the globe to consider Winnipeg for their next home base. We will tell the story. We want to work collaboratively with both the public and private sectors to make companies feel welcome here. We’re all on the same team and working more closely than we ever have before. Ubisoft will have a direct influence on Winnipeg’s economic growth by broadening the tax base and creating new jobs. This will be felt in other industries and for other companies – a rising tide lifts all boats. If we want to compete for these companies, we need to continue investing in our business attraction strategies. Companies from across the world are waiting to hear about what Winnipeg can offer them. If we can inform them, they will come. For now, we welcome Ubisoft. Dayna Spiring is the President and CEO of Economic Development Winnipeg, Inc.